Things seem pretty much back to normal at Cape May today, though I am sure that there are still odd birds re-positioning after the hurricane that have yet to be found. First things first, Cape May Point State Park is open; the staff have done a good job cleaning the trails out of debris and it all looks good again. I had a quick look this morning and the beaches are remarkably intact, with evidence of overtopping by the sea but no damage. The ponds are at winter height (!) so there's little or no marginal habitat for shorebirds at the moment, but Derk Visser reported an American Bittern at Bunker Pond this morning and Black Terns continue both there ans at Lake Lily. The male Ruddy Duck continues on Lake Lily too - he first turned up somewhere around July 17th if I remember rightly, but hasn't had much of a mention on the blog here. Both Cape May Point and Higbee's Beach had good flights of commoner bird species this morning and Michael O'Brien found two Sandwich Terns and confirmed three Eurasian Collared Doves still alive and well in the area. There's been a massive clear out of terns in general, but a good selection of species can still be seen on the beaches around the point. At the Northwood Center, I seem to add a new bird to the day list every time I look out of my office window, so there's certainly a nice trickle of birds going on. Most recently, Yellow-billed Cuckoo, Black-throated Blue Warbler and Swainson's Thrush were out there, the latter just on the early end of migration here. At the coastguard base, Chris Hajduk reports one or two Brown Pelicans on the Poverty Beach pilings and the local pair of Peregrines still using the water tower from time to time. Finally, please be aware of possible traffic congestion locally as people return after the passing of Irene, and please stay cool, have fun - and tell us if you find something good!! We all love birding, and we never like to miss the opportunity for a good bird, but unfortunately a few negative comments are finding their way back to me with regard to the Brown Booby. 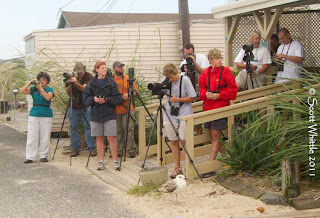 While the Brown Booby will give you fabulous views if you take the time to enjoy a great back bay boat trip with either The Osprey or The Skimmer, it can also be scoped distantly from Two-mile Landing which is a marina and site of a former restaurant along Ocean View, just south of Wildwood Crest and opposite the Coastguard Ponds. Much of the land at Two-mile Landing is private, and much of the land is closed to public access. There are clear signs there indicating private property and indicating where it is OK to park. We are hearing that these signs are being ignored. Having just spoken with the Dockmaster, I also understand that there is an issue with people driving too fast on the entrance road and around the parking areas. Courtesy and good manners cost nothing and mean that we are able to continue to birdwatch on the site. If you have visited before and think that you know the site, do please note that things may have changed since you last visited; don't take anything for granted. Please, please, please heed these simple rules for the sake of all birders, both local and visiting, and for the perceptions that others have of us. Hurricane Irene passed by Cape May in the wee hours of Sunday morning, 28 August, making landfall (eye -- or center of circulation -- crossing onto land) up the coast at Little Egg Inlet sometime after 5 am. The numbers tallied of individual species noted below should be considered preliminary, as the list-keeper (me) was not always able to keep up with all the sightings (or heard about them). 6:00 - 7:00 -- Though it couldn't be seen from here, sunrise saw Michael O'Brien and me standing vigil at Sunset Beach in the lee of the southwesterly winds provided by The Grille (we arrived at 6:15), waiting for birds. Which species, precisely, we could not guess, but waiting none-the-less. Upon our arrival with no problems with the roads, we texted that fact out, and others started to arrive; Vince Elia promptly and Dave La Puma after making his way down from Villas. In the first 45 minutes of watching and hoping, we noted a single Least Tern (getting late for the season) and a sizable northward movement of Barn Swallows (57). 7:00 - 8:00 -- Bob Fogg had arrived at Norbury's Landing pre-sunrise and struck paydirt first -- a bit after 7 am -- with an Arctic Tern. Michael countered with a one-upping adult and juvenile Roseate Terns on the beach before 7:30. Bob came back almost immediately with a Parasitic Jaeger heading north. Around 7:35, Bob came back with an immature Lesser Black-backed Gull past Norbury's Landing. 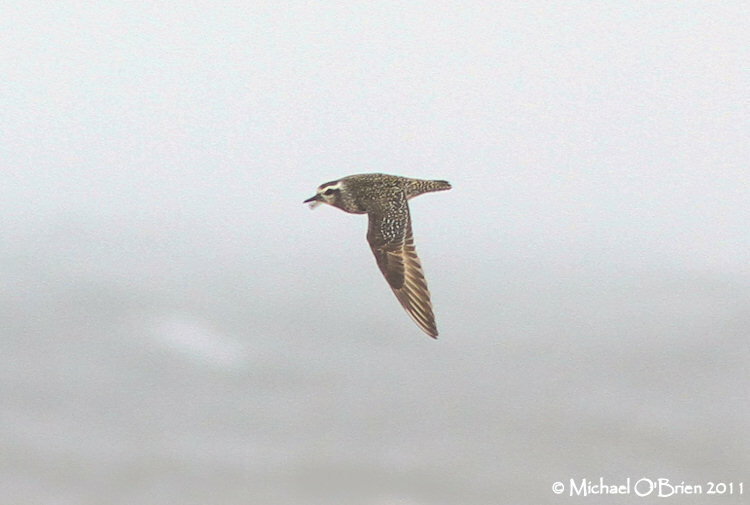 At this point, Tom Johnson, who was heading toward the Cape from the Philadelphia area, cruised the sod farms in Salem Co., noting large numbers of shorebirds and Laughing Gulls, along with a Baird's Sandpiper and a Black Skimmer, a species quite rare that far inland. After the Roseate Terns, the best that the Sunset Beach gang (which now included Scott Whittle and Sam Galick) could find in this hour were two Wilson's Storm-Petrels, singles of Black Tern and Least Tern, two Sandwich Terns, and the continuing northward movement of Barn Swallows (31). 8:00 - 9:00 -- Scott Whittle found a female-plumaged Surf Scoter on the water which, due to the high seas, played hide-and-seek with everyone. Bob noted a second northbound Parasitic Jaeger early in the hour, with the Sunset Beach gang finding a "definitely probable" juvenile Long-tailed Jaeger that may or may not have been the same distant dark jaeger as noted a couple minutes earlier. Unfortunately, after this point, Bob's phone ran out of juice, so I don't have any record of the rest of his Norbury's Landing count and, unless noted, all sightings are from Sunset Beach, which talled singles of Wilson's Storm-Petrel, Least Tern, and Chimney Swift (this becomes important later) in the hour. 9:00 - 10:00 -- Shortly after the start of the hour, two adult and one age-unknown Sooty Terns initiated a flyby to the great joy of the building crowd, which now included Mike Fritz and Glen Davis, among others. 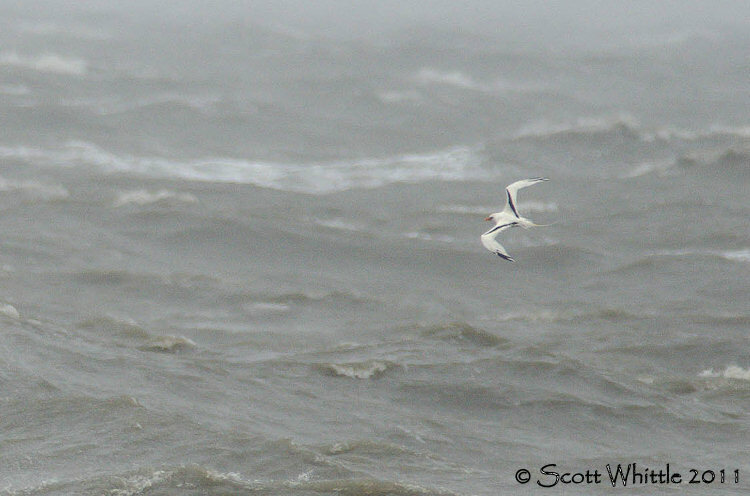 In fact, Mike found the next "good" bird, and what a doozy it was, an adult White-tailed Tropicbird! Because of the unprecedented number of the species found on seabird cruises in the northwest Atlantic Ocean this past summer, some of us were considering that this species, of which there is only one previous New Jersey record, might be seomthing that we could find this day. A long shot, yes, but possible. Make that DEFINITE! Also passing this hour were a Wilson's Storm-Petrel, two flocks of 2 Red-necked Phalaropes (southbound), 2 Black Terns, a Parasitic Jaeger, and -- after an hour with none following a strong northward movement early -- 16 Barn Swallows southbound. 10:00 - 11:00 -- WIND, WIND, and more WIND! For nearly all of this hour and some of the next, the wind kicked up a few notches, sand-blasting our cars in the parking lot (and any leaving the safety of the The Grille's porch) and breaking a cable over the parking lot, which then twisted in the wind. Sometime during this hour, the highest Irene-spawned on-land-in-New Jersey wind gusts were recorded, with the peak of 71 mph at Cape May. Visibility was, at best, quite skinny and few birds flew, at least, in the direction that they faced and with only 8 species recorded in the hour. The number of observers crowding onto the deck at the The Grille increased further, with the arrival of some younger Pennsylvania birders and Kevin Karlson, among others. 11:00 - 12:00 -- With the lessening of wind speed and lightening of cloud cover, bird movement picked up in the last half-hour. Among the more "mundane" species, 2 adult American Golden-Plovers, a flock of 24 Pectoral Sandpipers, a Red-necked Phalarope, an unidentified phalarope (Red/Red-necked), and an unidentified jaeger were enjoyed by all, particularly the golden-plovers, which flew right down the shore past us. An adult Bridled Tern heading north woke everyone up, but was upstaged by something paler. Actually, two somethings paler. Just before noon, Tom Johnson yelled out -- and I mean YELLED -- "TROPICBIRD!" Someone else who quickly got on Tom's bird YELLED, "TWO!" Many of the photographers in the crowd raced out to the beach to photograph the TWO ADULT White-tailed Tropicbirds flying south offshore in tandem. 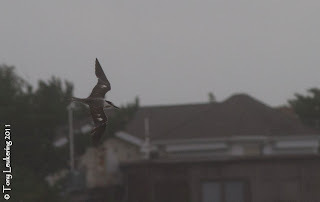 12:00 - 13:00 -- While singles of Western Sandpiper and Belted Kingfisher were new for the day -- as were the bits of blue sky, this hour saw the rise of numbers of "tropical" terns, those dark-backed pelagic species that are nearly synonomous with hurricane fallouts, Bridled and Sooty terns. 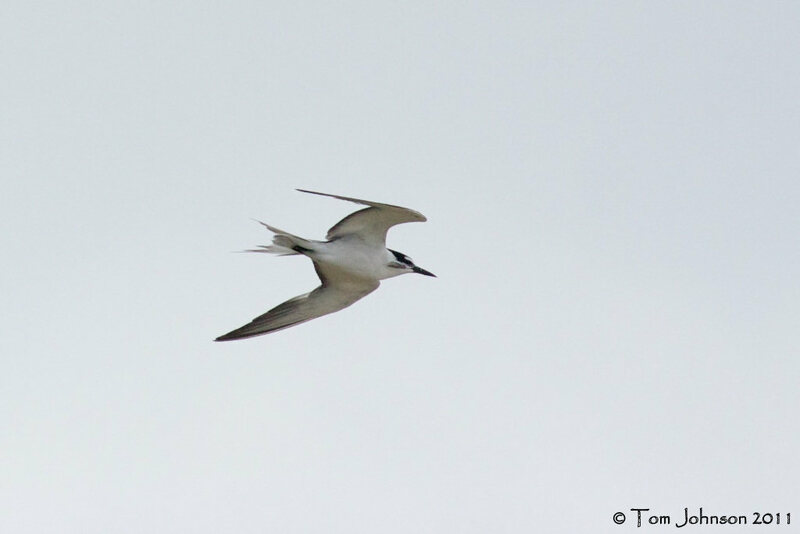 Three adult Sooty Terns were tallied, along with one adult-like Bridled Tern that put on a good show for viewers and photographers. This individual flew close by The Grille, even flying over land between Sunset Beach and Alexander Avenue, as it waffled on its plans, eventually flying back north. 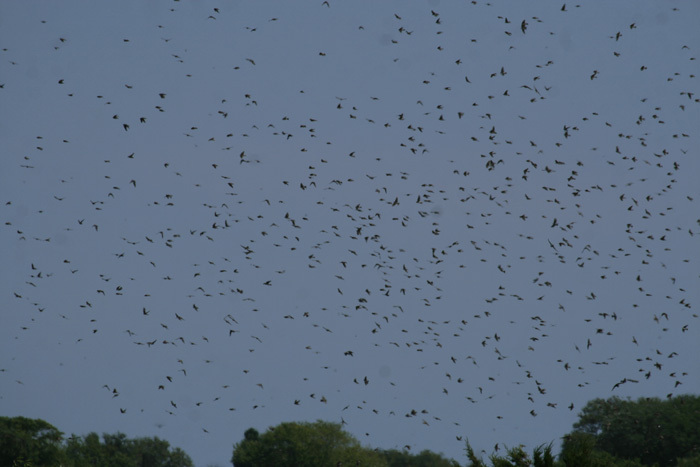 13:00 - 14:00 -- The first Purple Martins (38) of the day were noted among the increasingly swirling batch of Barn Swallows and a flock of 15 Pectoral Sandpipers heading south past us hosted the only White-rumped Sandpiper of the vigil. Another Wilson's Storm-Petrel was tallied and 3 Stilt Sandpipers were sorted from a southbound flock of 13 Lesser Yellowlegs. 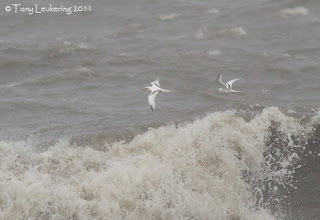 The hourly highlights were 3 Bridled Terns and 1 Sooty Tern. 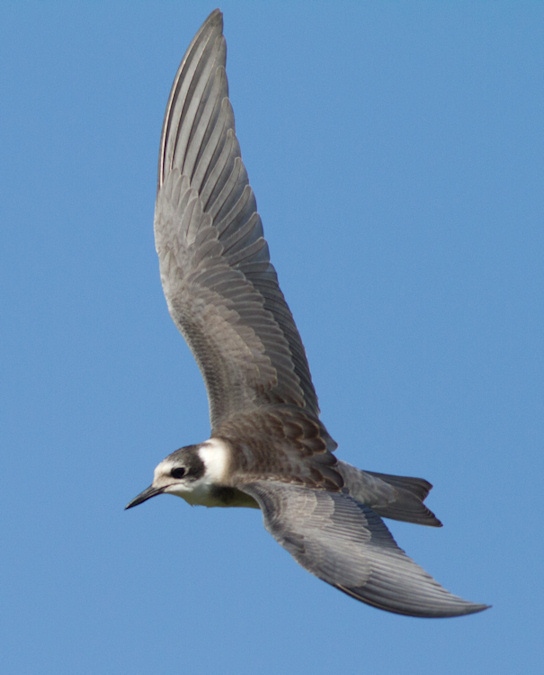 14:00 - 15:00 -- A bird seen up the bayshore shortly after 2 pm and first thought to be another tropical tern became, upon slightly closer approach and better angle, a Black-capped Petrel. Though many present had been hoping for multiple Pterodroma petrels (and multiple species thereof), this would be the only one noted. Additions to the tallies of already-recorded species included singles of Wilson's Storm-Petrel, Pectoral and Stilt sandpipers, and Least and Sandwich terns; 2 Red-necked Phalaropes; 2 Sooty Terns; and 4 Bridled Terns. Species added included Short-billed Dowitcher (3) and Lesser Black-backed Gull (1). Jim and Deb Dowdell joined the ever-growing crowd. Little did we all know though, that Black-capped Petrel and White-tailed Tropicbird were both about to be forced down a notch on the list of Best Birds of the Day! 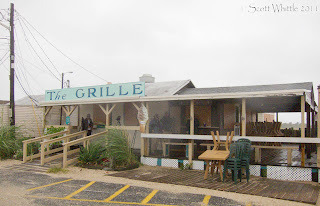 Around 2:24 pm, I was standing in the parking lot in front of the Sunset Grille when I noticed a dark, long- and narrow-winged bird north of the gift shop across the parking lot from the Grille that I first thought was a small falcon. However, I quickly realized that it was a SWIFT. Wow, a two-swift day! I turned and shouted for everyone to "GET ON THIS BIRD!" 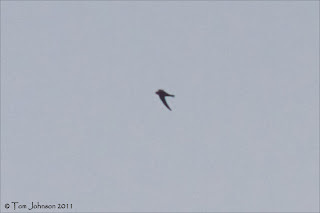 This big, apparently-all-dark swift with very long wings that were pinched in at the base, an attenuated rear end, and a flaring and notched tail exhibited wingbeats that were quite slow and deep for a swift as it was drifted north away from us by the wind. Our collective opinion was that the bird was probably either a White-collared Swift (Streptoprocne zonaris) or a member of one of the species of Old World swift in the genus Apus. Alpine Swift (Apus melba) has occurred on Barbados, so that was in the mix, but that species sports a bright white throat and belly. Though none of us had experience with Old World swifts, most Apus have more-deeply notched tails than exhibited by the Sunset Beach swift. Those of us with Middle American experience all considered that the bird was not inconsistent with an identification of White-collared Swift, a species with a few ABA-area records, including one from the northern Lower Peninsula of Michigan. Tom Johnson obtained a number of semi-reasonable pictures of the bird that we have sent off to various experts for their thoughts. 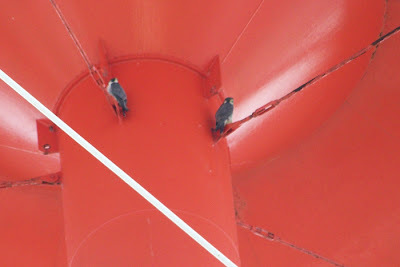 The pictures prove that the bird was not an adult White-collared Swift, but the white on juveniles is restricted to the nape. 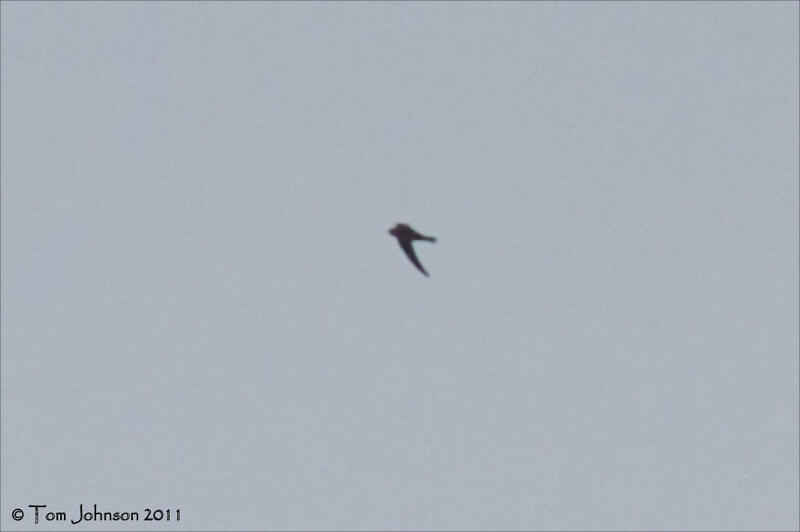 Personally, until I hear otherwise, I consider the bird to most likely be referable to White-collared Swift. Should that ID be correct and should the New Jersey Bird Records Committee accept the record, it would be a first for the state and for the northeastern United States. 15:00 - 16:00 -- More interesting terns were added to tallies this hour, including 5 Blacks, 2 Bridleds, 1 Least, and 3 Sandwich. The swallow show picked up even further, with some Purple Martins and Barn Swallows heading out across the Bay into a 30-35 mph SW wind. Quite a few species were added for the day: Osprey, American Oystercatcher, Willet (a juvenile of the western form), Common Nighthawk (over the Bay), and Tree and Bank swallows. 16:00 - 17:00 -- Tern tallies this hour included 5 Blacks, 2 Sooty, and 2 Sandwich. Bald Eagle and Ruby-throated Hummingbird put in their only appearances of the day at the site. With conditions improving, both atmospheric and aquatic, the number of "interesting" birds was on the decline and the gang started breaking up, with most leaving shortly after 5 pm to see what could be seen elsewhere. The final tally of species noted from the Sunset Grille was 53, but that count included only 6 species of passerines (4 swallow species, Bobolink, and House Sparrow). Yes, a paltry number for late August in Cape May, but I didn't hear anyone complaining. 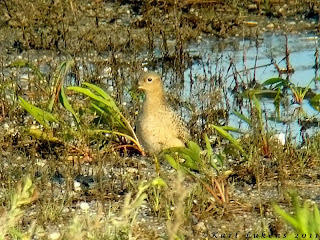 Elsewhere - Glen Davis reported a juvenile Buff-breasted Sandpiper at the South Cape May Meadows and the Brown Booby continues in Jarvis Sound. Speaking ... er, writing of which, the landowner at Two-Mile Landing is becoming quite annoyed with birders, so please exercise extreme consideration if visiting the site; park well away from the water back by the trailers; drive slowly; obey all signage. This is private property and we could easily be excluded from ALL access. Don't ruin it for everyone else! At this point, Irene is onshore in North Carolina heading our way. Currently, the projection is that it passes offshore of us, which probably reduces the intensity of the storm onshore -- versus having the eye passing to our west. Bob Fogg noted a 2nd-cycle Lesser Black-backed Gull on the beach at Del Haven, south of Norbury's Landing and medium-sized (read, Forster's and Common) and Black terns struggling up the bayshore. A 20-minute count at Sunset Beach just before 7 pm had 200+ Common Terns (and a smattering of Forster's and Royal terns) standing on the beach right next to the parking lot and with 100s more coming in from the south. Unfortunately for them, the tide was rising, as were the seas, and waves were forcing them off the beach. This up-Bay movement will probably continue and, with the passing of Irene tomorrow and a switch in wind direction, almost anywhere along the Delaware Bayshore could see good movements of terns heading back down bay. But, I reiterate Tom Reed's note -- if you attempt birding on the shore tomorrow, please use all caution and common sense! Cape May County is under a mandatory evacuation today due to the threats from Hurricane Irene which is likely to pass by very near to the area over the weekend. Updates to this blog will resume once everyone returns and we can assess the storm's impact. If you go out birding during or after the passing of the storm, good luck, and please be careful. A large flock of gulls and terns was feeding in the rips off Cape May Point mid-morning today, and scanning for a while turned up a few nice surprises. 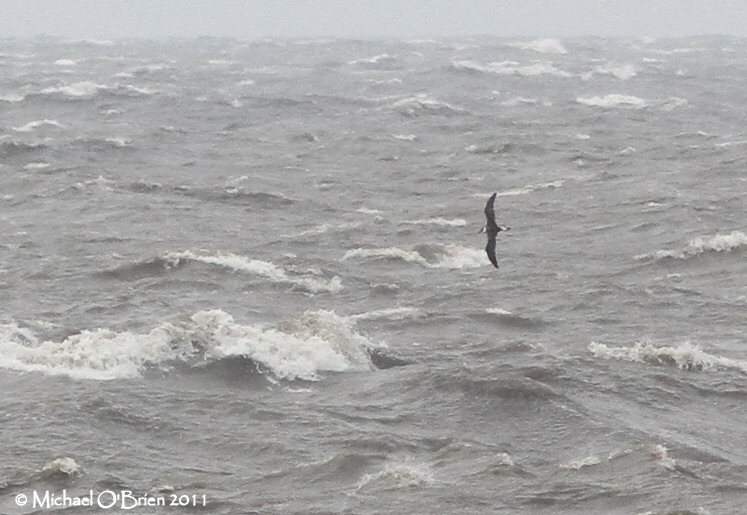 The first was an immature Pomarine Jaeger that was beating up on Laughing Gulls fairly close to shore (photos below). 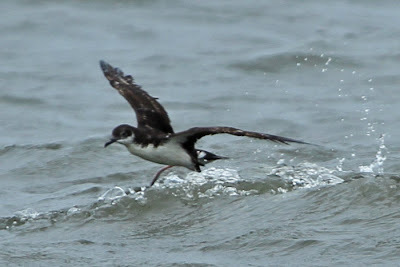 Later, Chris Vogel found a Manx Shearwater that played hide and seek for a little while before disappearing. Other uncommon birds in the area included 1 Wilson's Storm-Petrel, 2 Gull-billed Terns, 1 Caspian Tern, and 1 Parasitic Jaeger. 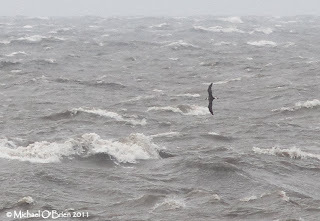 The Pomarine Jaeger was fairly large and slow in level flight, with a chesty build, noticeable white flash in the upperwing, and a "double flash" in the underwing. This "double flash" is caused by the bases of both the primaries and the underwing primary coverts being white, and is a good cue to look for to help identify young Pomarines. Pomarine Jaeger is considerably rarer from shore in Cape May than Parasitic Jaeger, but is probably the most common jaeger species in the pelagic zone off the mid-Atlantic at this time of year. With the prediction of NW winds all day in Cape May, I headed my car to the point to see if Dave Hedeen's prediction of a count of 13 American Kestrels moving by the Hawkwatch Platform in Cape May Point S.P. would prove out. I arrived at 9:30 and spent two hours watching the tern show there (more on that in a bit) before Dave and Meg showed up a bit after 11:30. By that time, I'd "counted" one Broad-winged Hawk and noted one juvenile Cooper's Hawk, one Osprey, and one distant adult Red-tailed Hawk not moving, so I didn't "count" them. Then the dam... well... it started leaking. A bit after noon, we had two female American Kestrel go by and by the end of the day (I quit at 5 pm), I had tallied 10 American Kestrels. Ah, well Dave, you were a bit off. 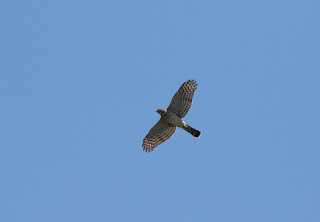 But, the raptor total for the day was 16 migrating birds, with two each of Cooper's Hawk, Broad-winged Hawk, and Merlin. Not too shabby for 22 August! The fall count season started, though the Hawkwatch has not, when Tom Johnson climbed the dike at Higbees Beach SWA before sunrise on 16 August to initiate the Morning Flight count for the fall, which will continue to 31 October. In a bit over a week, Melissa Roach will arrive in preparation to conduct the hawk count once again, starting on 1 September, with the count continuing through 30 November. Also at that time, Tom Magarian will start his efforts as the Swing Counter, filling in for the three primary counters on their days off. Finally, on 22 September, Tom Reed will get the Seawatch going, which will end on 22 December. So, back to the subject of this essay. The platform, as I've written before in this venue, is a magical place. Its large sky, variety of nearby habitats -- particularly the adjacent coast and Bunker Pond, and elevated viewing make this site hard to beat for racking up ABA-area bird variety while sitting on one's bum! Today, the magic was provided primarily by terns, with an uncountable number of six species coming and going throughout the day. Particularly interesting were the Black Terns, which are putting on a good show in many areas of lower Cape May County. Though I never saw more than five at once today, Black Terns were dropping in and departing regularly, particularly in the middle and late afternoon, and I would hazard that 75+ popped in over the course of my 8.5-hour tenure there. Bunker Pond's lowish water levels are providing for loafing areas and a great place to study the variety of ages and plumages of both Common and Forster's terns. One (or more) Royal Tern made several appearances, as did one (or more) Least Tern. Finally, an adult Caspian Tern with one kid in tow was present most of the day, with a second adult being seen once in the afternoon. The adult, in addition to giving its youngster fishing lessons, was also, apparently, attempting to give at least one fish flying lessons. [This adult Caspian Tern caught a fish in apparently very weedy water in Bunker Pond and, while apparently trying to maneuver the fish and all those weeds in its bill, let it slip. 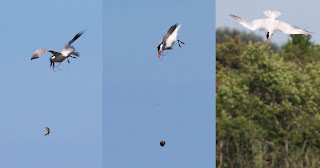 As can be seen in this composite of three images, it chased after it, exhorting it to flap its wings and stay aloft, but to no avail, with the fish hitting the water and neither the tern nor a nearby Laughing Gull being able to save it from that horrid fate. In related news, Chris Vogel noted 1000s of terns on the beach at Cape May Point early this morning and others noted one Sandwich Tern and a leucistic Laughing Gull there. Chris also saw two Parasitic Jaegers (an adult and a younger bird) close to shore. Tom Johnson and others had their slow day on the Higbees Beach dike enlivened by a close Cerulean Warbler. Michael O'Brien reported large numbers of Laughing Gulls and terns -- including two Sandwich Terns -- moving by the South Cape May Meadows in the evening and, a bit early, the first Yellow-rumped (Myrtle) Warbler of the fall. On the subject of warblers, Bernie Master noted a Brewster's Warbler (the dominant form in the hybridization of Blue-winged and Golden-winged warblers) at Higbees Beach SWA. 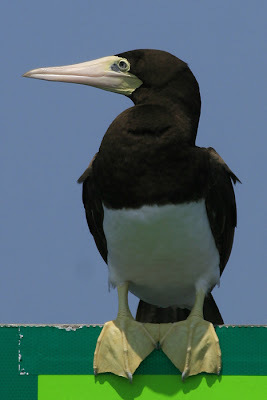 The adult female Brown Booby continues to delight observers, whether they are standing at Two-Mile Landing or taking a two-hour cruise of the back bays on Bob Lubberman's Osprey. Though it is readily seen from shore, the views provided aboard are incredible! Tonight's forecast calls for NW 10-15 mph, with N winds tomorrow. I'll probably be counting hawks again. The Brown Booby was seen again this morning in Jarvis Sound, as viewed from Two Mile Landing. Trips aboard The Osprey will be departing at 10am, 1:30pm and 6pm. OK, so you know where to be at Noon on a Sunday in August; where should you be at Noon on a Saturday in August? Well, it turns out that one of our newest volunteer naturalist recruits, Tom Baxter knew. Tom was onboard The Osprey working as the trip naturalist when he spotted a bird that really didn't look quite right for what you would normally expect to see sitting on a channel marker in the middle of Jarvis Sound. Pretty soon, Tom realized he was looking at a Brown Booby! And a shiny adult at that!! Jarvis Sound is the first open body of water in the back bays north of Ocean Drive. The bird can be scoped from Two-mile Landing, but please observe on-site signs there as areas that were once open to access are now out of bounds - please don't upset the locals! For even better views though, you can head out to within 20 feet of the bird on The Osprey. Call Captain Bob Luberman on 609-898-3500 for details of sailings. We all missed the Manx Shearwater, but this time we got lucky and hopefully the Brown Booby will hang around at least for the weekend. Also on the backbays today were a single Marbled Godwit, Tricolored Heron, several Yellow-crowned Night Herons and a good range of the regular shorebirds. So, how in all this do you decide where to be at Noon on a Sunday, in the middle of the tourist season in mid-August? Shopping somewhere out of town right? Or at home doing those household chores that need sorting out; a bit of gardening; dealing with emails... If you were doing any of those you made the wrong choice last Sunday! It turns out that Bernard Master new what to do though; he took the family down to play mini-golf at Sunset Beach! Being a shrewd family man though, he also took his binoculars and - luckily for us - his camera. What we all missed was superb views of a Manx Shearwater which spent at least 30 minutes flying around the concrete ship and plunging for fish with the local Laughing Gulls! Sibley's The Birds of Cape May lists just five records of this species to the end of 1994 around Cape May, with only one of them reported from land, so this is a fabulous find for Bernard and another one to have to catch up on for the rest of us! 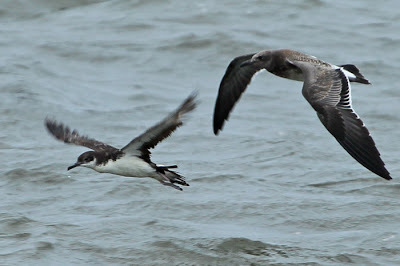 Manx Shearwater at Sunset Beach, August 14th [photos by Bernard Master]. Manxies can be confused with Audubon's Shearwaters, but at this range they are easy to tell apart. Note the white undertail coverts (darker in Audubon's) and note the white crescent curling up into the dark upperparts behind the eye. The bottom picture with a juvenile Laughing Gull gives a good size comparison. The busy and exciting September period will soon be upon us, which means we're all beavering away and preparing for it - which adversely affects our blogging time, but here's an update on a few sightings I've heard about over the last few days. So lets start with Saturday and Sam Galick's news that there was three female Wild Turkeys with 15 youngsters along New England Road; doubtless we'll lose a few during the hunting season, but it's nice to know that these inveterate tick-eaters are increasing south of the canal! On Sunday, Bill Boyle reported six Stilt Sandpipers on Bunker Pond, the best count for some time for this species at the point, while Karen Johnson's backyard mister continued its good form up in Eldora with Mourning, Canada and Golden-winged Warblers. Higbee's Beach is starting to be the place for early morning walks now and with Tom Johnson in place on the dike (welcome back Tom! ), we can be sure of regular counts and updates from there on our View From The Field page. On Saturday, Sam Galick reported three Black-billed Cuckoos, five Blue-winged Warblers and 15 Blue Grosbeaks around the fields at Higbee's, continuing the good numbers of birds seen there on Friday. At the state park, at least two Black Terns have been hanigng out, variously alternating between loafing on Bunker Pond and feeding over Lighthouse Pond. One is a nice, black-bodied, if a little speckly now, adult, while the other is a smokey-gray youngster. Amidst all this, there's been a couple of highlights for me too; on Monday we had the awesome spectacle of six Bald Eagles circling over our house. Two were adults, with one of them carrying a fish and three were youngsters - presumably all from the local nest. The other I didn't see so well and may have been this year's or last year's bird, but certainly an interloper and seen off by one of the adults. With both Turkey and Black Vultures and a couple of Ospreys up at the same time, it was quite an event! The other highlight for me came on Tuesday morning when a look at some Higbee's Beach management that needs doing on a parcel of land next to our property turned up a weird-looking warbler which proved to be a Lawrence's Warbler. Never heard of it? Lawrence's Warbler is a peculiar looking bird which is actually a hybrid between Blue-winged and Golden-winged Warblers. First generation hybrids between these two are called Brewster's Warblers, but Brewster's are fertile and if one breeds with either of the original parent species, second generation young are produced which can show an assortment of plumage patterns which are generally a mishmash between the two species. My guy was a pretty typical bird with greenish upperparts, yellow underparts and a grayish shadow pattern of dark eye patch and throat. Over on the other side of town, I rely a lot on Chris Hajduk to pass on sightings from the Coastguard Unit area. I hear that up to five Black Terns have been in the channel around the toll bridge on Ocean Drive and - just in time for this post - I just heard that Chris had what may well have been a Brown Booby, which flew north off Cape May around 3:30PM on Saturday - go find it! 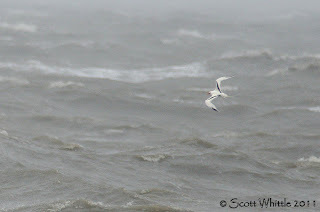 Today was the first day of the Fall 2011 Morning Flight count at Higbee Beach in Cape May. Daily updates can be found on CMBO's other blog, View from the Field. Once the hawk count and seawatch begin in September, even more updates will be available on View from the Field. Enjoy, and good birding! Our first Higbee's Beach walk of the season was timed to perfection as the first noteworthy cold front from the north-west saw my thermometer reading a mere 59F first thing this morninig. That might not sound so cold, but it's a significant drop from the 90+ temperatures we've had of late. And with the front, came the birds. Actually some of us speculated on the front over a great meal and a few beers overlooking the harbor last night; most were hopping with excitement but the sagely Tony Leukering noted "It will be good, but good for August 12th". And of course he was right; it is still early in the season and too early for a major flight, but there was much get excited about and the parking lot was pretty full by 07:00 this morning. The expected flight of Red-winged Blackbirds and near-invisible "link"ing Bobolinks passed overhead, along with an assortment of herons, which for us included two Tricolored and three Little Blue Herons. Blue-gray Gnatcatchers, Cedar Waxwings and assorted warblers flighted over and the annual gathering of Eastern Kingbirds had started, with at least 35 noted. Warblers in the trees were not numerous but included several very showy Blue-winged Warblers (I heard of at least nine being seen) and a scattering of American Redstarts, Yellow and Black-and-white Warblers and a single Chestnut-sided Warbler. Chris Vogel reported two Canada Warblers to me. Those tricky Empidonax flycatchers are starting to arrive too and we managed to pick out one Alder and two Least Flycatchers, while others added an Acadian to the list. We finished our walk with a fly-over Common Nighthawk and others added Yellow-billed Cuckoo to the list too. A few Blue Grosbeaks, Red-eyed Vireos and assorted breeding birds such as Prairie Warbler and White-eyed Vireo all added to the mix. Elsewhere, Sam Gallick and Tom Reed found a Yellow-rumped Warbler - usually the species that signals the end of fall - let's hope not! At the Northwood Center, Blackburnian Warbler and Alder Flycatcher were found, but at the state park, there was no sign of yesterday evening's American Avocet. At the top end of the county, Karen Johnson reported Mourning, Yellow-throated and Worm-eating Warblers at her backyard mister - it's a different world up there! Angel dust appears to be covering Cape May Point at the moment and everyone I talk to is noticing it. Tony Leukering has already posted about the dragonfly movement taking place right now and pretty much everywhere you go there's black specks in the air - and that's dragonflies, hundreds of thousands of them it seems and all doing a great job tackling the mosquitoes here. Yes, dragonflies eat mosquitoes so they are certainly our friends and, provided they are left alone with places to live and breed, they will continue to repay us by keeping those pesky little flies away. Isn't nature wonderful! As well as the dragonflies, a different angel dust can be seen along the South Cape May beach. Yes, it's time for the annual build-up of Tree Swallows and currently they are swirling around in a dramatic cloud and, like the dragonflies, helping to reduce pesky fly numbers. Tree Swallows also gather here to feast on the bayberry berries which will be ripening in a few weeks and providing vital fuel to get the swallows going on their southward migration. Struggling to see a Clapper Rail? Well, whilst I would be the last person to ever suggest they are easy to see, or 'guaranteed', Bob Lubberman's trips aboard the Osprey have really been turning up trumps lately and I reckon one of Bob's trips right now would certainly give a better than average chance of seeing one of these oft ellusive birds. Here's just a few of the pictures Bob recently sent me - and you can tell how close they were to the birds by the fact that they are looking down at a couple of them! Bob told me that no-one really had a decent camera so these are cell phone shots of birds at distances down to less than 10 feet! I especially like that lovely golden glow on the first one. Michael O'Brien spent some time at the Coral Avenue crossover this morning, recording a smattering of flyovers of typical early-fall migrant warbler species (e.g., Black-and-white Warbler, Northern Waterthrush, American Redstart) and two interesting shorebirds: 1 each of American Avocet and Upland Sandpiper. Upland Sandpipers were also noted yesterday at the Cape May Airport by Rick Radis and flying over Sea Grove Avenue by Vince Elia. This is the peak of fall migration timing for Upland Sandpiper, and their musical and diagnostic "whit-a-whit" is readily given by individuals flying over; listen for it particularly at night for your yard bird if that species is not on your yard list yet. Upon returning to my Villas home late this morning, I noted that Swamp Darners (Epiaeschna heros; New Jersey's largest dragonfly species) were streaming by heading north up the bayshore, so I quickly put my stuff inside and came out with binocular and clickers to tally the movement. As is typical, they were headed into the wind (which was roughly NW). From 11:04 to 12:04, I clicked 3160 Swamp Darners, 9 Wandering Gliders (Pantala flavescens), 4 Spot-winged Gliders (P. hymenaea), 4 Common Green Darners (Anax junius), 3 Carolina Saddlebags (Tramea carolina), 1 Black Saddlebags (T. lacerata), and 14 Eastern Cicada Killers (Sphecius speciosus), the large wasp that captures cicadas to feed to its young. I saw only one dragonfly heading against the grain, that being a male Black Saddlebags. Michael O'Brien also reported "hundreds" of Swamp Darners heading north past the end of Alexander Avenue on Cape May Point. 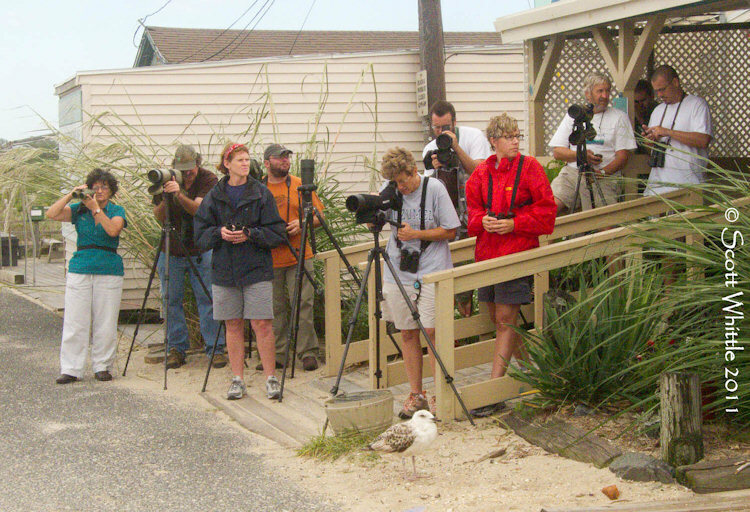 August can be a great time for birds at Cape May, but it seems it's also a great time for local birders to either be too busy to go birding (never a comfortable state of affairs!) or off on vacation elsewhere. The last time I received a text message about anything other than the two Eurasian Collared Doves was last Friday, when Don Freiday noted Northern Gannet, two Wilson's Storm-petrels and 10 Brown Pelicans from the ferry - though the birds were apparently in Delaware waters. There has been several Brown Pelicans reported to the Northwood Center, the biggest group being of 14 past Sunset Beach a couple of days ago so it is certainly a good time to be looking for these monsters flapping around the point. Chris Hajduk tells me that small groups of them have been hanging out on the pilings at Poverty Beach so they should be viewable from the far end of town, near the coastguard unit. In desperation, I did find time to make a quick check at the state park this morning and can confirm that the ponds there are still alive with a mass of birds! Herons and egrets are plentiful and there are good numbers of Lesser Yellowlegs, Semipalmated and Least Sandpipers, Semipalmated Plovers and a few Spotted Sandpipers. Four Red Knot buzzed over and headed south out across the bay. Terns still abound on Bunker Pond with 1500+ mixed Common and Forster's Terns present, while my quick scan turned up a juvenile Black Tern - and my ears turned up a Sandwich Tern, though I never did lay eyes on it! The trails were hot when I was there late morning and thus predictably quiet, but I did notice Northern Waterthrushes on nearly ever open channel that I crossed by way of the little metal bridges and there were certainly several Yellow Warblers calling. Note that the Plover Pond protection fence has been removed now, so you can once again do a complete tour of the ponds from the state park end. Our next walk at the state park is scheduled for Wednesday at 07:30AM, while Friday at 07:00AM sees the start of our Fall Higbee's Beach walks - really? Summer is over? Those rather tricky, rather 'samey' little brown birds that are oh, so confusing to beginners are well known as 'Little Brown Jobs', but the term could be applied to the highlights of the Cape May Butterfly Survey this year too. Rather annoyingly, after weeks of glorious sunshine and soaring temperatures, the weather decided it was time for a change and drab skies and cooler weather no doubt played a part in keeping our count numbers down. But we all persevered! This annual survey follows similar lines to the well known Christmas Bird Counts; the area is split up into manageable chunks and teams of observers go out and count what they can find. Covering the Lower Township area from the Cape May canal north to Rio Grande, Tony Leukering, Glen Davies and I had a fun time, despite the dull weather (which even dropped some spots of rain on us) and found a good range of butterfly species. Typically in dull conditions, it's the darker species that are more active as they can soak up the sun more readily than paler species and this indeed proved to be the case, with the skippers - the epitome of little brown jobs - being relatively numerous and second only to the abundant Red-banded Hairstreaks that crowded the Sweet Pepperbush flowers. Here's a few photo highlights from our afternoon. Red-banded Hairstreak is a plentiful - though easily-overlooked - species in Cape May County. Dun Skipper - another easily-overlooked species as it lurks low in long grass a lot of the time. This is a male with a distinctive, ochre-colored head. Swarthy Skipper - another long-grass lurker, this time with a butterscotch underside and pale veins. One we missed on the survey but which I spotted in the garden this evening, Hayhurst's Scallopwing - probably one of the best butterfly names of all! Note the shadow - the sun was back again this evening! Around Cape May Point, Fall migration grows a-pace. Michael O'Brien's terns workshop started well today with both Black and Sandwich Terns and six Lesser Black-backed Gulls on the beach, with the bonus of a fly-by Brown Pelican. No sooner had Karl Lukens reported that a Eurasian Collared Dove was still present on Lincoln Avenue than news came through that two were present - is this rapidly-expanding species finally going to settle at Cape May? The wet weather overnight maybe stalled a few things, but Northern Waterthrushes and Yellow Warblers are leading a slow but steadily-growing vanguard of songbirds heading through the point now - the weekend looms and Higbee's beckons!